Something doesn’t add up when historically underrepresented groups miss out on opportunities in statistical sciences. Enter StatFest, an annual conference overseen by the American Statistical Association (ASA) through its Committee on Minorities in Statistics and held this year at Amherst College. 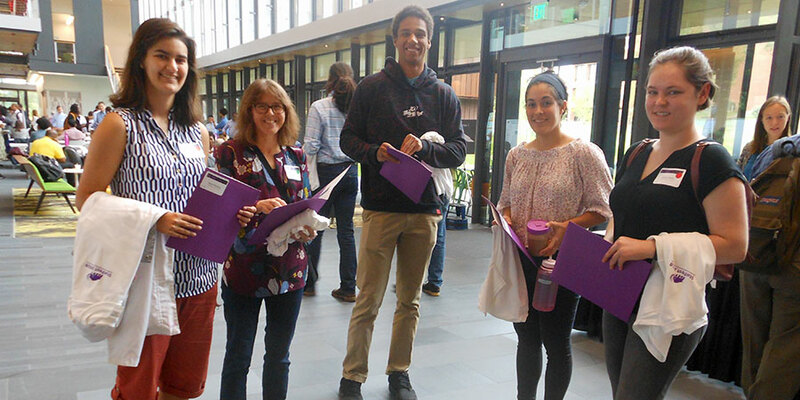 “The conference was about encouraging diversity in statistics, and it was really thought-provoking,” says UVM Senior Lecturer Karen Benway who traveled to StatFest 2018 with four students and fellow faculty advisor and Senior Lecturer Katherine Merrill. Some 150 attendees from 90 different institutions gathered for the one-day event on Saturday, September 22, which featured keynote speaker Scarlett Bellamy. When she was growing up, “There were no clear, obvious messages that somebody like me should be doing a STEM degree,” said the director of the graduate program at the Department of Epidemiology and Biostatistics at Drexel University’s Dornsife School of Public Health. Bellamy grew up in rural North Carolina and surmounted many challenges to land in her current position. “For better or worse, this kid who grew up on a tobacco farm is now a public health research scientist,” Bellamy said. “It wasn’t always easy.” Her presentation focused on three aspects of finding success in statistics: nudges, grinding and grit. Networking was a key objective of StatFest 2018, which broke the conference into five breakout sessions around tables and comfortable couches and provided several other opportunities for networking including: a continental breakfast, a morning break, lunch, an afternoon break and a poster session with an ice cream reception. (The poster session allowed attendees to present their research.) Networking tips and best practices provided by the ASA included such advice as “be intentional,” “think long-term” and “listen.” A networking tracker chart allowed students to record their progress. As a faculty advisor to the trip, Merrill says she appreciated the emphasis on networking, and saw Donati connect with MassMutual. (Other attendees included representatives from Major League Baseball and Bank of America.) “It was very empowering,” says Merrill. Benway adds that the speakers also inspired the students by sharing their own struggles to find their way into the field of statistics. A keynote address by Fernando Pérez, Professor of Statistics at the University of California, Berkeley and Senior Fellow of the Berkeley Institute for Data Science, traced his journey from Colombia to creating the award-winning iPython project, which evolved into Project Jupyter. Another speakerspoke of his being laughed at for his math skills while growing up in inner-city Chicago, and then going on to have a long and distinguished career as a statistician. “Until StatFest, I hadn’t realized how accessible graduate-school is or how broad the statistics career field is, and the conference was an excellent introduction to those topics,” says Jenny Eberling ‘21, who won a prize for being one of the top networkers at the event—despite reporting that networking does not come naturally to her. Previous StatFests have been held at North Carolina State University, the University of Chicago, Howard University and Emory University.